I'm following this thread and now I'm unsteady. Who made your differential? Who made your car? Looks can be deceiving, but that filler hole looks so low that it seems that differential wouldn't even hold much fluid at all to begin with. The photo I posted of the original differential is taken slightly from the top as I was only interested in pointing out how the original differential covers were vented, no elaborate catch can or breather hoses needed. 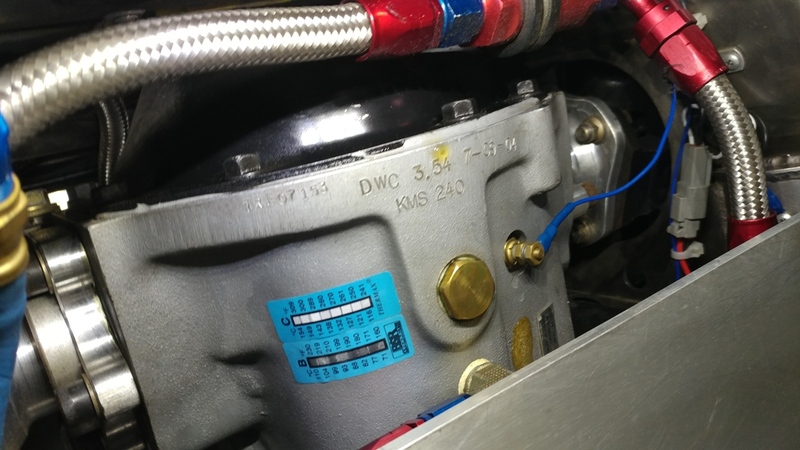 The proper vents allowed the lubricating oil to stay where it should, in the differential! It appears your differential has the breather installed the way David Kirkham recommends it to be installed. Last edited by CompClassics; 04-15-2019 at 09:25 AM.. I'm similar to the originals. This is a crappy shot, but I did just change the fluid in there over the winter. It's a Salisbury unit, but it's not identical to your shot or what went in the originals; my casting is different. It does have a Powr-Lok in there along with Dana 44 gears. It's vented about as simply as it can get I think part of the confusion on the differential threads over the years is that we don't stop to think what's in the other guy's car. We assume it's the same as ours (if it's the same brand), and we are all getting so damn old that we forget the difference between similar sounding rears, like TrueTrac and Trac-Lok. I remember threads where the Kirkham had a Jag-based rear in it, but I don't know how common or uncommon that is. Unfortunately, a lot of high-end Cobra owners around here would be hard pressed to tell you exactly what sort of limited slip they had in their rear, much less whether it had clutch disks, gears, needed a friction modifier, or why in the world it might pump gear oil up, up and away to begin with. I'm trying to remember if I recall anyone with a Jag-based rear complaining that their gear oil got too hot -- maybe that's more of a TrueTrac thing. You are using the same differential cover that I am using and they have a little longer breather tube than the original that I posted the photograph of. It really does not matter what is inside the differential as far as gearing or the type of carrier the gears are attached to, the pumping action that causes the fluid to be pumped out is the ring gear spinning and whipping the oil against the inside of the differential cover. Because there is no baffle at the breather hole the fluid is forced into the hole and travels to the breather can where it fills the can to the point it spills out of the can. You are using the same differential cover that I am using and they have a little longer breather tube than the original that I posted the photograph of. It really does not matter what is inside the differential as far as gearing or the type of carrier the gears are attached to, the pumping action that causes the fluid to be pumped out is the ring gear spinning and whipping the oil against the inside of the differential cover. 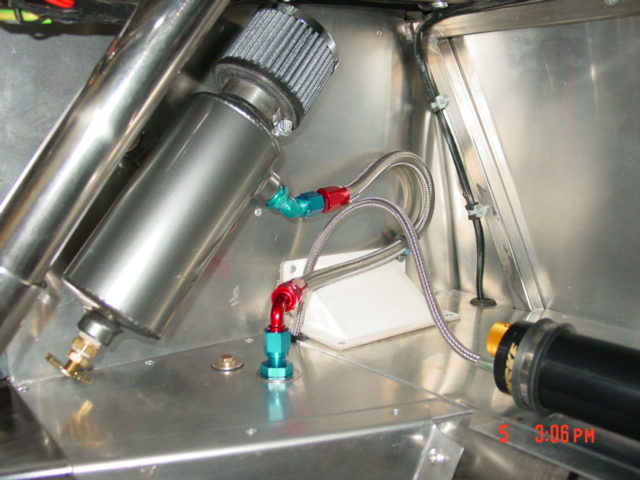 Because there is no baffle at the breather hole the fluid is forced into the hole and travels to the breather can where it fills the can to the point it spills out of the can. The temperature of the fluid is not the reason for the oil being pumped into the catch can, although the oil does become more liquid with heat. OK Guy's allow me to do some explaining of the diff and it's operation regarding the Venting of the Differential. I'm starting with a Jag Cover right off of a Jaguar Diff .... if you will notice it is to thick to install on a Cobra as there is not enough room because of it's cooling louvers, but it does show what the level should be in a Dana 44 type of Rear End. Now if you look at a Kirkham Rear End you can see where the fill hole is and see that compared to the Jaguar's Cover it is raised to high. Back in 2004 Tom and David and I discussed this and what we realized was that the Rear Cover they were using was off of a Front Differential on a Jeep Dana 44. If you will notice that the fill hole is way to high ....therefore to much oil was being installed into the Rear End because the fill hole was at least 3/4" to high.... When a couple of folks that purchased the first few Kirkhams ....they noticed this issue of pumping oil out of the rear end and filling up the catch can. When I was building KMP259 and I got to this part of the build I needed to come up with a solution to solve the issue. Looking at both of the covers you see this difference in the fill levels. Now lets turn them over and look at the inside of the two covers. Now you can see the how much higher the fill hole is on the Front Jeep cover verses the Stock Jaguar Cover. Also you can see how Jaguar approached the Venting issue inside of their cover.... 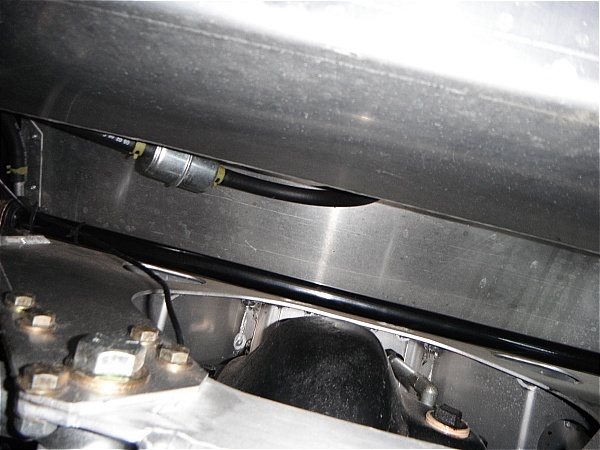 So many of the Mfg's have install fences and boarders around the Vent hole on a Stock Jaguar. So the MFG's have addressed this issue long ago. However the power and acceleration of a Cobra is way different then a Jaguar or any other Sports Car. Also Those of us that have spent time Racing and on Race Tracks realize that the Mfg's build for the street and We have to modify many componets in our cars so they are safe and capable of Acceleration and Braking and the fluids stay where they are suppose to. eschaider, CompClassics and 1795 like this. Last edited by Morris; 04-15-2019 at 02:17 PM..
Now you can see what we did to modify the Rear end Cover. We knew from past experience that we needed to separate the gear wash from the ring gear & the Differential to the Vent of the Rear End. That way you don't get any pumping action from the gear wash pressure coming off of the spinning unit. Also you can see how the Fence is on a angle to catch the gear oil coming from the Differential as well. The next part we wanted to experiment with was Drilling a Hole in the top of the Rear End and move the vent up to the top. There is not much room on the top of the Rear End when installed in the vehicle. We drilled an installed a 1/4"NPT x 90* AN-6 Fitting so we could vent the Rear End from the top... the Top of these Rear Ends are very thick and that aids in the the ability to drill a nice large hole so the velocity is much slower for the air movement in the vent hole where as the rear cover used a much smaller hole and that would have a much higher pressure of oil & air coming thru it. 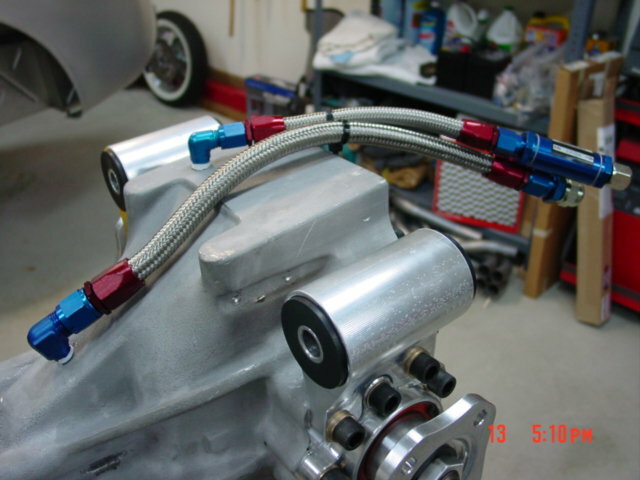 You just have to use a leader hose cause you can't get any wrenches up in that area. The other item you will notice is that our return line from the Cooler goes into the Pinion Bearing and that is what that hole is used for... that is not ....and I repeat that is not a Vent hole.... I think some will use it as a Vent hole but it is not a good place for the vent....as the gear oil wash is completely trying to cover the pinion bearing like it should..... One last comment ....you will notice we use a coarse filter on our vent hose.... that will stop oil and only allow air to pass thru to the catch can. Very important. 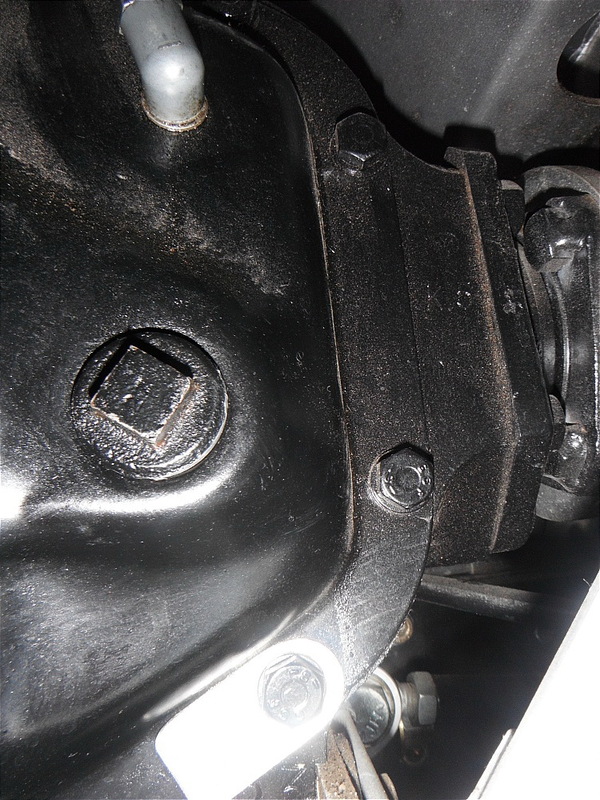 The stock Jaguar cover works correctly for street or track use, so does an original Cobra type cover. I know several vintage racers that use nothing but the original type covers. Last edited by CompClassics; 04-15-2019 at 02:55 PM..
Then they are not going very fast.... and will have to modify their covers eventually ..... If they want to go fast and keep their Rear End together. 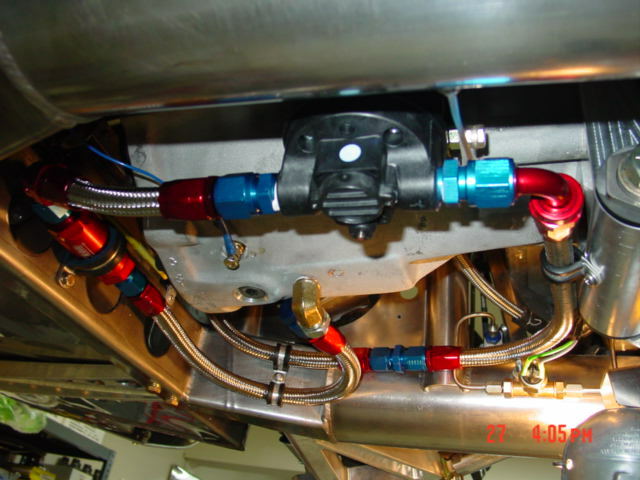 Here's a photo of the Plumbing on the bottom of the Rear Enc.... it will show where we take the oil out and go thru a filter and then the pump and then up to the oil cooler inside the drivers side rear fender.... also the temperature gauge wire and sending unit. Now if you look closely you'll see the date when we did all of these Mods to the Rear End.... 2004... and these mods have been tested at speeds of 185 mph at Road America and Gateway International and Autobon Motorsports many times. also you can see we use a Templac to make sure our guages are reading right. Last edited by Morris; 04-15-2019 at 03:44 PM.. Here's the way we get to the hose and Rear end to service it. 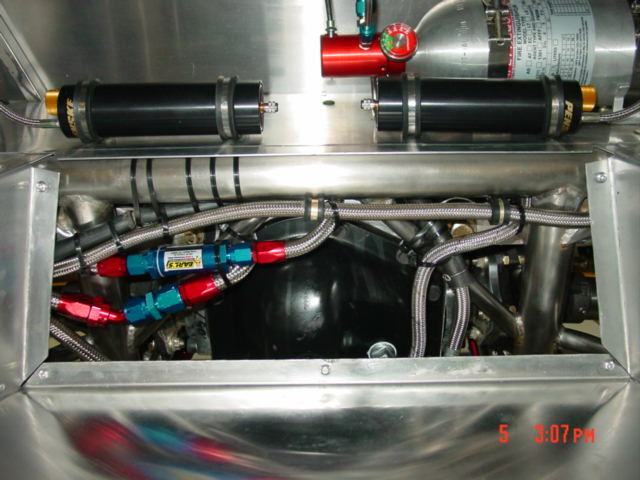 The Vent hose has the filter on it and the pump hose is going to the cooler and the others hose are Fuel Cell plumbing. Catch cans are exactly what they are meant to be....The idea of putting the hose for Gear lube in the bottom of a catch can is not very smart.... the amount of Gear oil that can drain back into the Rear End thru a 3/8" hose is unrealistic ....just pour some in a can and see how long it take to drain thru a small hose. Therefore don't kid yourself into thinking that it will drain back when you stop for a bit.... if you are filling up your catch can, then you have another issue and that will have to be taken care of before you drive the car again or get back on the track again. 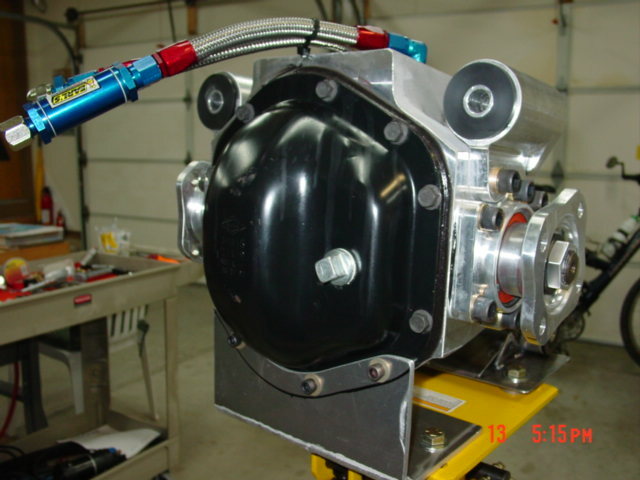 A catch can is to catch fluids that try to escape a Motor, Transmission or Rear End. the rules say you need a quart can for each unit and that's why we mount one on the Motor, Trans & Rear End. Most Rear Ends only hold a couple of pints in the Rear End it's self.... when we add a pump and Cooler to the fluid lines we will add additional fluid to reach the level in the Rear End while the pump is running that way we know all of the lines and Cooler are filled to the proper level. Fix the issue before the issue fixes you. Morris motivated me to go down to the garage and check my filler hole. If you're wondering what the little shiny tag says it's 46/13, which is my ratio. We did Morris' recommendation for the inside of the rear cover on the 289 FIA race car. We have the finned aluminum cover and Morris is correct, it will not fit in a cobra without making some room for it. Given that this is a race car and I do not care how the interior of the trunk looks, we cut out a panel in the trunk to allow for the finned cover to fit and increase air flow through the fins for cooling. It also makes it a lot easier to fill the differential when we do maintenance on the car. Being that it is a race car, I am changing the differential fluid a lot sooner than most of you would be. Morris and CompClassics like this. Did you install a differential cooler in your Cobra? Last edited by CompClassics; 04-15-2019 at 05:36 PM..